Last week we went over the numerous mounted digital prints we made for Ansell Sandel Medical Solutions. Today we will be focusing on some larger signs we made for their conference rooms. Conference rooms have many uses. Whether you are holding an employee meeting or introducing a potential client to your business, you want the room to represent your company and have a professional look. Ansell has two conference rooms. For the smaller conference room, we made a 10 sq. 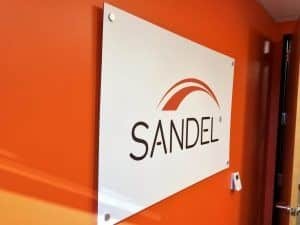 ft. digital print of Sandel’s logo that was mounted onto a sibond backer panel. The panel was laminated with clear, matte vinyl so there wouldn’t be a glare when the natural light came into the room and we mounted it with satin silver standoffs. Before installation, the room was painted to match the logo so the sign looks great inside of their new conference room. 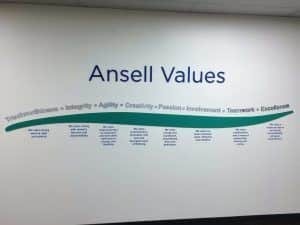 Outside of the larger conference room, they had a lot of wall space so they wanted asked us to make a large wall sign that displayed Ansell’s values. This sign required a lot of different materials to create the end result.match the other conference room sign so it also has a matte finish and was mounted with satin silver standoffs. 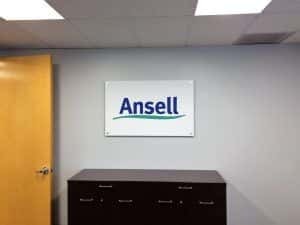 “Ansell Values”, the largest letters on the sign, was routed from acrylic and painted. The letters above the “swoosh” are also acrylic dimensional letters, however, instead of painting them, we laminated the faces with aluminum to give them a metallic look. The “swoosh” from their logo was made from sibond that we cut and painted. Sibond is the same substrate we used for the digital prints, however, the sibond we used for the “swoosh” was double the thickness. It needed to be 5 ft. long but since the substrate didn’t come that long, it was actually made in two pieces. We tried our best to install it in a way where the seam wasn’t noticeable. Lastly, the quotes at the bottom were cut from digitally printed vinyl. The vinyl we used is very high-quality and it is actually commonly used for car wraps so it is very durable. We frequently use it for wall graphics to ensure longevity. If the vinyl doesn’t come in the color the customer needs, we will digitally print the color first and then plot the letters out. Both conference rooms and even outside of the conference room looks great thanks to their new interior signage. Stay tuned for the final installment of our blogs where we will be going over the lobby area.